Is Your Vision Suffering from Cataracts? Gradual changes in vision can often go unnoticed if you do not have regular eye exams. If you are age 60 or older, your vision may be suffering from cataracts. However, you may be compensating for these vision changes or simply think that you have to live with inferior vision as you grow older. This could not be farther from the truth. Although cataracts affect half of all Americans by age 75, this is a treatable condition with cataract surgery. At Mosaddegh Eye Institute we perform cataract surgery in San Francisco to help patients restore their clear vision. Cataract surgery is considered a safe and effective procedure when performed by an experienced doctor. An eye exam will detect the presence and severity of cataracts. It is quite common to have cataracts but still be able to live your life without them affecting your day-to-day life. As they grow in size and opacity, they can make it more difficult to drive, read, work, participate in sports and do hobbies. It will be up to you to decide when you want to improve your vision – and your quality of life – through cataract surgery. While some people may never need to have surgery, this can lead to blindness. Untreated cataracts are the main cause of blindness worldwide. If you have noticed that your vision is not as crisp as it used to be, contact us today to schedule an eye exam in San Francisco. 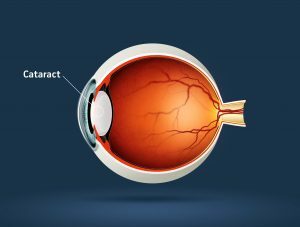 If cataracts are to blame, we can monitor the progression and recommend treatment options if necessary. Video: Cataracts, What Can You Do About Them?